Becoming Mama tells the incredible story of one woman who had the courage to lay everything aside in answer to God's call. Why would any woman choose to leave the comfort of her North Carolina home to return to the land she fled in her search of a better life? What would cause her to resign from her stable job with its steady income, sell her car, close her retirement account, and trade it all in for the responsibility of running an impoverished school with an uncertain future on a remote mountain in Haiti? For Yvrose Telfort Ismael, it came down to a dream and a chance to say "yes" to God. When Yvrose fled her native Haiti for the United States, she couldn't imagine she'd return. After suffering multiple miscarriage, she struggled to build a new life. In a desperate moment, she finally met Jesus-uttering her first "yes" to God. That one yes became many when she couldn't forget the faces of the children she saw in a recurring dream. A trip to Haiti brought her dream to life, leading to Yvrose's return to her homeland fulltime. When a catastrophic earthquake devastates the nation, she becomes Mama to the many children under her care. You will be inspired as Yvrose turns to God in the midst of pain. You will be encouraged by God's overwhelming faithfulness to her every yes. And you will learn you don't have to sell everything or travel to far-off places to make a difference. All you need is an open heart ready to say yes to His call. 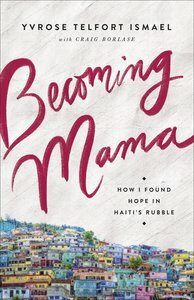 About "Becoming Mama: How I Found Hope in Haiti's Rubble"